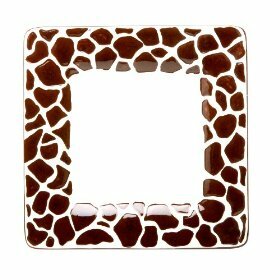 Set of 4 giraffe print salad plates, square silhouette moves easily from casual to formal occassions; Includes 4 – 8.5″ square salad. Designed in California by Laurie Gates. Composed of high-fired ceramic earthenware (salad). Dishwasher-safe; Microwave at low settings only as item become warm/hot to touch after heating. Use precautions when removing item from microwave. Made in China. 3. More importantly, new and innovative hand painting, glazing, and firing techniques are developed with each new collection.